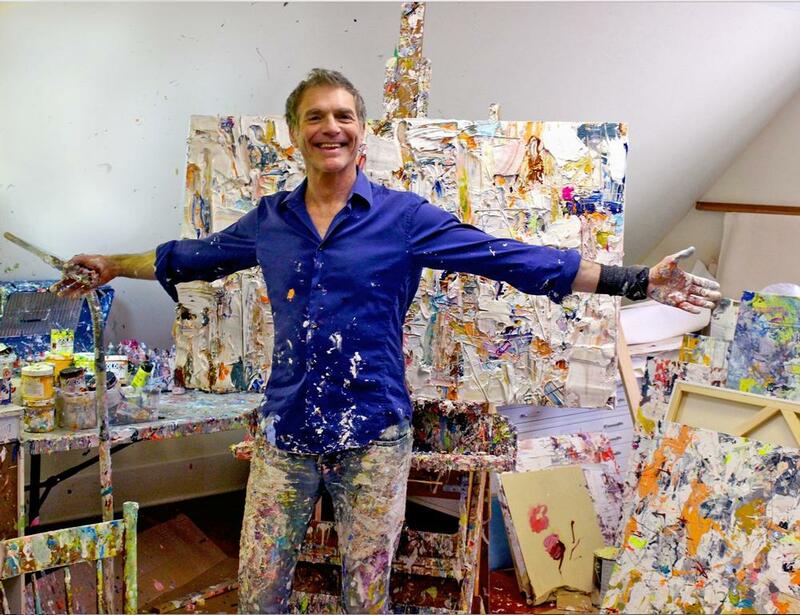 Adam Cohen is an artist who not only thinks outside the box, he lives it. His work is the culmination of deeply personal experiences-- both exhilarating and horrendous-- that have enabled him to transcend intense experiences and transform them into works from his soul. Cohen's fascination with color and composition started when he was a child growing up in Englewood Cliffs in Northern New Jersey. He created extraordinary color compositions and shapes that continue to reflect the longing for a childhood of inventive playfulness and pure innocence. Cohen enrolled at Philadelphia's Tyler School of Art at Temple University (BFA), as well as the School of Visual Arts, Parsons, the Art Students League, followed by studies abroad in Rome. In 1989, using Photo Shop 1, Cohen was one of the very first artists ever to use the computer for art-making, launching his career as a top illustrator. Cohen was the priority hire for mass campaigns by high-profile clients such as Disney, Visa, MasterCard, Coca-Cola, CBS-TV, McGraw-Hill, Pfizer, Orion Pictures, Verizon, AT&T, The Atlantic Monthly, Dean-Witter, The New York Time and many others. A painting by Adam Cohen is like a sudden burst of light. Vision is dazzled by a surface alive with color, swarming with incident. For Cohen’s brush is versatile. Dabbing, smearing, dripping, splashing paint onto the canvas, he creates a variety of textures equal to the variety of his reds and yellows and greenish blues. As you approach the canvas, it feels as if it were coming forward to meet you, to immerse you in a field of visual energy. Stepping back a bit we see that the luminosity of his colors—above all, his passages of white—owe much to the contrast provided by patches of dense, lustrous black. In fact, Cohen often applies this hue before adding lighter colors. And sometimes, as in Mind Map, 2014, the uppermost marks include thin, sweeping streaks of black. Thus his joyously high-keyed images emerge from darkness, as day emerges from night. Beginning and ending with the same color, he invites us to see the passage of time in images that, on first encounter, gather us into a single moment: an immediate and all-enveloping now. So there are two ways of seeing Cohen’s paintings. The first is immersive. Vision plunges in and swims in an intricately layered, richly variegated environment. The second way is more contemplative: the slow deciphering of the painting’s logic. We try to figure out what this streak of red is doing here or that tangle of wiry white lines is doing there. Though this second way of looking is more considered, more deliberate than the first, it is far from dryly analytical. For Cohen is not the sort of artist who executes a work in accordance with a pre-established plan. He proceeds intuitively, responding at each stage to whatever he has just created. Engaged by the results of this process—in other words, the painting—we do the same, though we go in the opposite direction, working our way back from the finished image to a sense of origins. Along the way, we feel the currents of pictorial energy running over the surface and into depth. We note the interplay of layered dabs and patches of color, how each calls for the next or for any number of others. And we find, happily, that nothing is certain here—nothing except the inexhaustible versatility of Cohen’s imagery. The moment we see how a black passage interacts with a burst of red, the red connects with a nearby white. To paint, for Cohen, is to establish myriad connections, none of them rigid. Think of synapses with their inexhaustible capacity for linkage—though the metaphor isn’t perfect, for synaptic links depend on immediate proximity. Cohen’s do not. His colors often echo one another across the distances that separate them, enlivening the entire surface of the canvas with a pulse of organic vitality. Though we can never be certain if the scale of the image is micro or macro or that of the human body, there is no need to choose one scale at the expense of the others. Cohen has no wish to limit the range of our responses. Working toward a balance between calm resolution and restless possibility, he ensures that even after a painting is finished it is pervaded by an atmosphere rich with potential. How, then, does he know when to stop? What keeps him from working forever on a single canvas, realizing each new option as it emerges? These are questions raised by every painter who, like Cohen, has found a distinctive variation on the margin-bottom: 0.0001pt; text-indent: 36pt; line-height: 150%; text-align: left;">Of course, not every accident is acceptable. Some must be persuaded to vanish into the continuing flurry of gesture. Others are preserved and do their part to ensure that a painting never settles into a complacent state of resolution. Cohen keeps painting until the image is not only clear and harmonious but also animated by a kind of tension: the grand and provocative sort of ambiguity that leaves a work of art open to multiple responses. After the immediate reaction to a painting’s visual plenitude comes the slow delving into its past for an intuitive reconstruction of the painter’s process, and then a further, metaphorical reading. For each of these layered canvases, overflowing with evidence of its evolution, can also be seen as an image of the painter’s history—or one’s own. And Cohen’s margin-bottom: 0.0001pt; text-indent: 36pt; line-height: 150%; text-align: left;">In his earlier works, fields of color and texture have the breadth and openness of the sky or aerial views of the earth’s surface. So it’s no surprise to learn that, as these paintings were being made, they spent at least part of the time stretched out horizontally. Recently, Cohen has begun to apply thicker paints. This allows him to work on a canvas as it hangs in a vertical position, a change that has inspired a new kind of mark and a further range of allusions. Laying on thick layers of pigment, he cuts into them with a palette knife, the tip of a brush handle, or the head of a nail. The resulting patterns suggest writing on a page or, just as powerfully, maps and diagrams. In Spring Sequence, 2014, horizontal incisions work with verticals to imply a landscape shaped—and stabilized—by hints of architectural form. Here as in all of Cohen’s recent paintings, the marks’ disruptive force both accentuates and challenges the harmonies that connect underlying colors into a unified field. Calm makes a tentative peace with exhilarated energy and the emotional stakes are raised to new heights of intensity. And in that intensity we sense further possibilities. Cohen has created a way of painting with its future built in. 2017 Art Olympia Competition, June 15th exhibition in Tokyo with honorable mention. 80 artists selected from North & south America out of 4,200 entry’s.